Campbell Soup (CPB) is now promoting its soup brands at supermarkets throughout the U.S. just as the weather is warming and few consumers are looking for something piping hot to eat. It is the latest in a series of bad breaks and bad luck to hit the venerable food company. Marketing consultant Rick Shea says the Camden, N.J.-based company failed to promote its soup when the weather was cooler and consequently, sales dropped 8% in the quarter ended Jan. 31. Ready-to-serve soups, such as Chunky, decreased 18%. A drop-off in promotional spending was cited by the company as one of the reasons for the poor performance. Since spring has arrived, supermarkets are not terribly interested in using prime shelf space to promote soup. "Typically, retailers want soup promotions when demand is strongest from October to March," says Shea, who runs Shea Marketing Consulting Inc. in Minneapolis. Spokesman Anthony Sanzio says the company needs to remind consumers that soup is available in the warm weather. "People will eat soup in the spring and summer and fall," he says. Marketing remains a huge challenge for Campbell Soup, and that surprises some experts who argue that soup is the ideal product for these uncertain economic times because it's cheap and easy to prepare. After all, Americans gobbled up Campbell Soup during the Great Depression. People are also cooking less than ever, spending an average of 27 minutes a day preparing meals, according to the NPD Group, a market research firm. "There is no question about soup's place in our diet both as a main dish and as a side dish," says Harry Balzer, a vice president at NPD Group. The challenge for Campbell and its competitors is to make soup relevant to today's consumers worried about value and convenience. 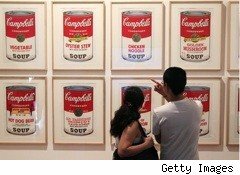 Indeed, Campbell's U.S. soup sales increased 5% last year, with growth in all parts of the portfolio. Volume is up 4.1% in the four weeks ending March 2, according to Anthony Sanzio, a company spokesman. "We remain optimistic about our entire soup business," he says in an email. Campbell has changed with the times. A few years ago, it slashed the amount of sodium in its soups and introduced a line of 100 low and reduced salt products. The company's efforts were lauded by activists such as the Center for Science in the Public Interest and have not generated many complaints from consumers. "They are going to maintain their flavor profile at any cost," says food retailing consultant Jim Hertel of Willard Bishop in Barrington, Ill. in an interview. Campbell Soup is forecasting that sales will rebound in the current quarter. The company says its condensed soup and broth business are performing well. Wall Street remains skeptical. Shares of the food company have risen about 5% this year. Most analysts rate the stock as a hold. As Bloomberg News notes, soup is losing ground to other simple meals such as frozen pizza and macaroni and cheese. The trend also is hurting Campbell competitors such as ConAgra Foods (CAG), maker of Healthy Choice soups, and General Mills (GIS), which produces Progresso soups. Chief Executive Doug Conant told investors during the fiscal second quarter earnings conference call that he was confident the company could revive soup sales. "... we were so focused on competing within soup that we didn't adequately take into account the increased competitive activity beyond soup in this broader simple meal category," he said. "We made that mistake once. We won't make it again, and because I don't want to have another call like this."